Saving money on groceries does not happen at the store. Saving money happens before you get to the store. Here are six steps to help you be fully prepared to maximize your savings. 1. Make your grocery list. 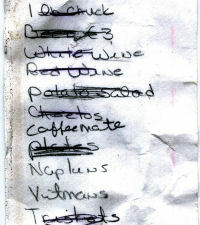 You list should include all the regular items your family craves, and the items you will need to make meals this week. The items you have on your list each week are considered your HOT LIST items. These should be items you trade coupons for on message boards and ask for from manufacturers direct. 2. Look at the weekly ad. Its easy to find the weekly ad, it's here every week. You just look it over for those items that are on sale that will make meal planning easy and save you some money. There are about 175 items on sale each week and we list the full ad on My County Market and the coupon match up on County Market Coupon News. 3. Go through your clipped coupons. If you see spaghetti sauce on sale, it may be time to redeem that pasta coupon. Look for good meal planning matches to your shopping list and the weekly sale. 4. Open up your apps. The My County Market App will have 30-40 items where you can make matches and save additional money. Plus it has the coupon wallet feature where you can see your savings adding up. Next, open Ibotta app for rebates it has additional money you can use on top of manufacturer's coupons. 5. Use the Penny Pincher booklet! It's full of deals that also offer stacked savings. These are County Market store coupons so you can use this coupon and a manufactuer's coupon on the same product. Penny Pincher coupon booklets are delivered inside your month price shopper in your mailbox. 6. Pack up your coupon stash and bring it along. You may find non advertised deals in store and want to make a last minute addition to your cart. If your coupon organizer is at home, you'll miss out on a deal. It never hurts to be fully prepared.